Want some pancakes, but have no pancake mix? No problem. Whip up your very own pancakes with this delicious whole wheat blueberry pancake recipe. Switch blueberries with fruit of your choice to make it your own. Sift together flour and baking powder, set aside. Beat together the egg, milk, salt, and artificial sweetener in a bowl. Stir in flour until just moistened, add blueberries, and stir to incorporate. 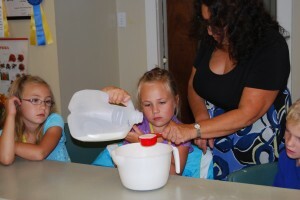 This entry was posted in Camp Blog, Recipes and tagged Blueberry Pancakes, Recipes, Tollgate Education Center Programs. Bookmark the permalink.